Lamb is delicious and contrary to popular belief it's super easy to prepare. It can be roasted, broiled, grilled, simmered or braised and has a mild almost sweet taste. Lamb allows you to eat healthy without sacrificing flavor. It's a complete protein and an excellent source of iron, zinc and B vitamins. Last year I had the pleasure of working with Mountain States Rosen company to create a recipe using one of their veal cuts. Well today I'd like to introduce you to their lamb. Cedar Springs Fresh American lamb is the result of good breeding and flock management. Raised on high mountain pastures in their natural environment, Cedar Springs lamb is 100% vegetarian fed and grain-finished. It provides a mild and delicate flavor with an excellent nutritional profile fitting perfectly into today's trend toward lighter, leaner and healthier foods. Cedar Springs Lamb is now being sold at Bashas' supermarkets. And Mountain States Rosen is offering one lucky reader a $50 gift card to Bashas' so you can try it for yourself. See below for details. 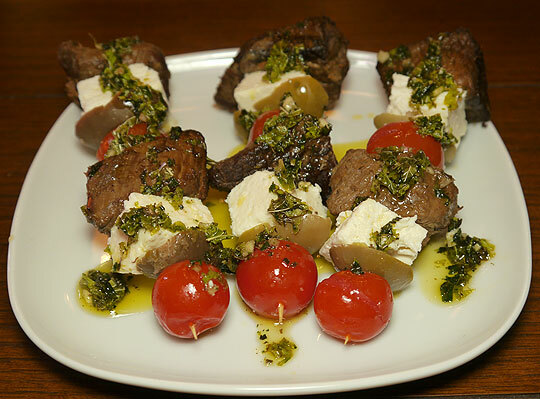 But first I'd like to share with you two recipes I created using Cedar Springs Lamb; a main dish and an appetizer. 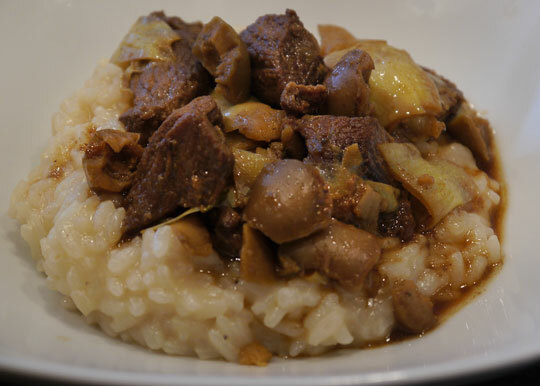 The stew uses lamb shoulder simmered with olives and artichokes. I like it spooned over risotto but it would go equally well served over pasta. I skewered the leftover stew meat with some roasted tomatoes, feta cheese and green olives to make a cool little appetizer. Drizzled with a little mint pesto these are a winner for sure. 1 cup green cerignola olives, chopped. Trim the fat from your lamb and cut meat into 2 inch pieces. Pat dry with a paper towel and season with sea salt. Pour olive oil into a dutch oven over medium heat. Add garlic and crushed pepper. Once garlic starts to sizzle add the lamb in a single layer. Place rosemary on top of meat. When the meat begins to sizzle cover the pan, lower the heat and cook about 10 minutes. Meat should begin to brown and release some of it's fat and juices. After 10 minutes turn pieces then cover and cook for another 10 minutes. Turn again and continue cooking, covered for 15 minutes or until lamb is nicely browned all over and the pan juices have started to caramelize. Be sure to drain off fat if it seems like there is too much of it in the pan. Add wine and vinegar to the pan. Bring to a boil and cook down quickly to form a thick sauce. Add the olives and artichokes, cover pan and simmer for about 10 minutes. Cook uncovered for the last few minutes to allow the flavors to mix. Serve over risotto or pasta. To make the mint pesto I pulsed fresh mint leaves with some garlic cloves and olive oil in a food processor until desired consistency was reached. Alternate ingredients on skewers and serve drizzled with mint pesto. Now that I have you drooling over lamb you will want to enter this contest. One lucky reader will get a $50 gift card to Bashas' Supermarket. To enter, simply leave me a comment and tell me what you would buy at Bashas' if you win. Following Mountain States Rosen or Bashas' or The Food Hunter on Facebook. Please leave a comment here for each one you do in order to be counted more than once. Entries will be received through Sunday, November 18th, 2012. Open to US residents only. I LOVE making a regional upstate NY dish with lamb called "Spiedies". It brings back a ton of memories! I follow Bashas on FB! I follow Mountain States Rosen on FB! I follow Basha's on Twitter! I have never made it but would love to try. I love lamb chops prepared on the grill with a little mint jelly. I guess I'm just a fan of an old favorite, but I am drooling over the stew with artichokes. It sounds delicious. I sent a friend request to follow you on FB. Happy Thankgving Day...Thank You For Invite! I would get lamb shanks or lamb necks; I've used the latter in a variation of osso buco, braising it. Delicious! I follow you on twitter (ljskop). I already follow you on Facebook and I think a gift card from Bashas' Supermarket would make the perfect holiday gift for my boyfriend in Phoenix AZ. He loves to shop at Bashas. We are a couple of foodies and it would go a long way to buy all the goodies for one heck of a festive meal. Lamb as our likely featured part. We both love lamb in every form and fashion.